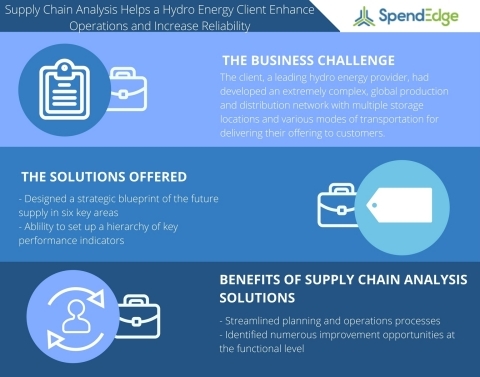 LONDON--(BUSINESS WIRE)--SpendEdge, a global procurement intelligence advisory firm, has announced the release of their new ’supply chain analysis study on the hydro energy industry’. A renowned hydro energy provider with multiple storage locations wanted to get a better handle on their logistics and distribution network. The client had developed an incredibly complex, global production and distribution network with various modes of transportation for delivering their offering to customers. Hence, they wanted to leverage supply chain analysis solutions to devise new strategies which would help them enhance their operational efficiency. Renowned hydro energy providers are leveraging the use of supply chain analysis solutions, as it facilitates better controls of procurement spends along with compliance monitoring. Supply chain analysis solutions also help businesses in developing an end-to-end follow-up procedure to resolve discrepancies in the supply chain network. The supply chain analysis solutions offered by the experts at SpendEdge helped the hydro energy provider in designing a strategic blueprint of the future supply in six key areas, including sales and customer service, operations, planning, supply chain network, organization structure, performance management, and IT. Our solutions also assisted the client in setting up a hierarchy of key performance indicators that aligned with their business goals. SpendEdge has announced the release of their Supply Chain Analysis Study on the Hydro Energy Industry.